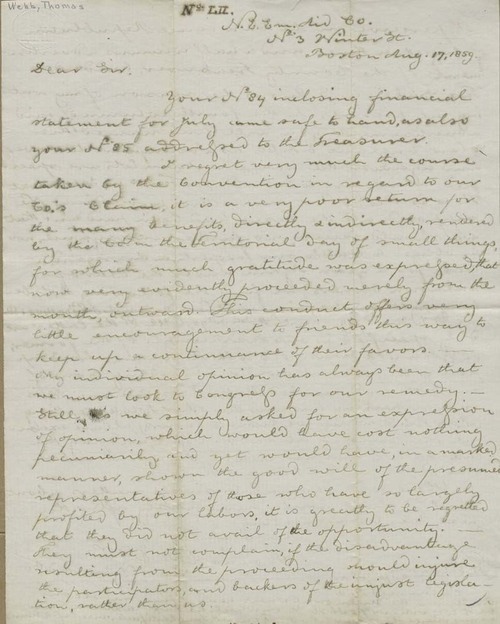 Thomas H. Webb, secretary of the New England Emigrant Aid Company, wrote from Boston, Massachusetts to Martin F. Conway, general agent for the New England Emigrant Aid Company in Kansas Territory. Webb expressed disappointment about the manner in which a territorial claims committee viewed New England Emigrant Aid Company claims for damages. He also stated his concern about seeing the Company listed as a delinquent taxpayer in the Lawrence Republican newspaper.